It may be a faux pas to put ice in wine, but there’s certainly nothing wrong with putting wine in ice. Especially when it looks this good. A big chunk of ice is always impressive, and sticking a bottle of wine through the center of it makes it even more so. That’s exactly what the Exaco Nice Ice Cooler can do for you. 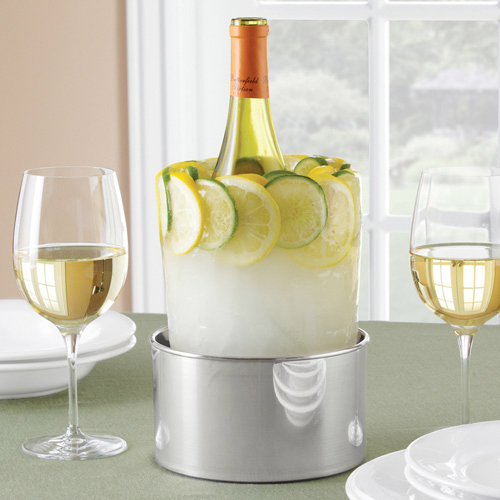 Part mold, part centerpiece, the contraption creates a tall cylindrical ice sculpture with room for a bottle of wine. Melting into the included base over a period of 6-hours (in a 70-degree environment), the novel wine cooler should (one would hope) last a lot longer than that bottle of wine it is meant to chill.